Join us! 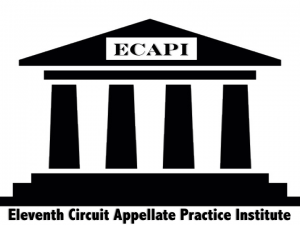 Nov. 8–11, 2018, in Atlanta, Ga.
AJEI is teaming with the Eleventh Circuit Appellate Practice Institute (ECAPI) to host a joint AJEI and ECAPI Summit. Join the 300+ appellate judges, staff attorneys and lawyers of AJEI together with the 200 lawyers and judges of ECAPI — all of whom make this a must-attend conference for anyone who practices in the appellate arena. This year’s summit will be held at the Atlanta Marriott Marquis, 265 Peachtree Center Avenue, Atlanta, Georgia 30303. Please use the links at right to review the schedule, registration information, and travel details. We hope to see you in November!